This recipe is an adaptation of one by Bruce Aidells, a formidable Bay Area sausage-maker and cookbook writer who knows more than a thing or two about meat. He came into school to demonstrate cutting up a pig, which we then cooked in various ways, trotters and all. One of the changes I made to his recipe is the use of a whole bottle of wine rather than a combination of a little beer or wine and stock. This was purely for practical reasons – I’m more likely to have wine in the house than stock – and works beautifully. Hungarians are very proud of their wine-making tradition, so it also seems appropriate. I also added the fennel and lemon. Like all good stews, this one tastes even better the next day, and freezes well. 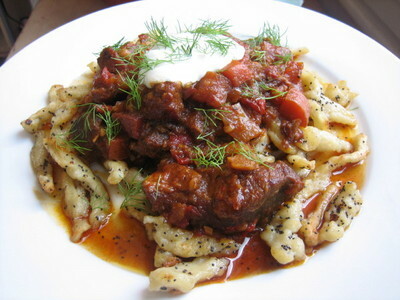 Many goulash recipes out there call for beef instead of pork, which I simply can’t understand – the porkiness seems essential to me. However, as we were to discover when travelling in Hungary, beef IS more traditional, and this recipe is perhaps more of a pörkölt or paprikás than a true gulyás – Hungarian stew classification is rather complicated to the outsider.